The Palm Springs City Council voted on Wednesday to approve a range of restrictions that will cut back on short-term vacation rentals, reports KPCC. The ordinance, which was approved with a three-to-one vote, will bar people from owning more than one vacation rental, prohibits them from renting out a property more than 32 times a year, and increases the annual rental permit from $200 to $900. Councilmember J.R. Roberts told KPCC that the most controversial regulation has been the rule limiting rental owners to just one rental. 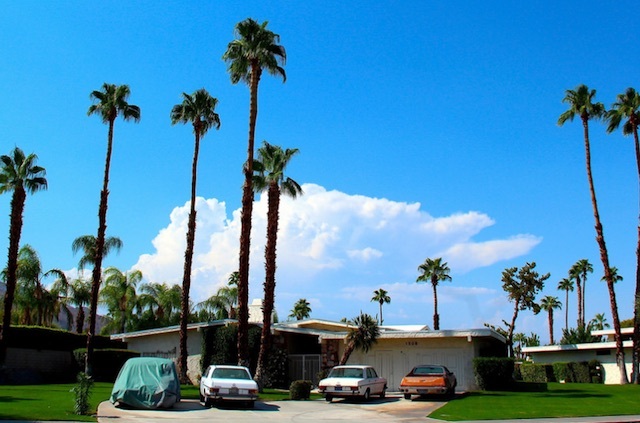 He believes it&apos;s justified, however, as a step towards preserving Palm Springs as a community, and as a means of keeping housing prices down for young families looking to move in. "What we&apos;re trying to avoid is people buying up neighborhoods for freestanding hotel room investments," said Roberts. Still, Palm Springs is very much a destination spot for people looking to get away for the weekend. A 2013 report by the Greater Palm Springs Convention and Visitors Bureau said tourism was a $5.8 billion industry for the area—a 9.4% boost from 2011, reports The Desert Sun. Tourism experts say that this is partly driven by mass-attended events like Coachella and the BNP Paribas Open tennis tournament, which take place in Indio and Indian Wells, respectively, both about a half hour drive from Palm Springs. There&apos;s also the fact that the city&apos;s "transient occupancy tax" generates millions of dollars for the city. As such, councilmembers strove to find a middle ground, rather than cutting down on vacation rentals entirely. "We tried to come up with something that would be legal, that would allow [rentals] to continue but would also minimize the negative impacts that happen to neighborhoods," Councilmember Geoff Kors told KESQ. Christopher Nulty, a spokesperson for Airbnb, said that the move could be harmful for the city&apos;s economy. "We are disappointed to see Palm Springs embrace arbitrary home sharing rules that will cut off an economic lifeline for many residents and have a long term negative impact on the local tourism industry," Nulty told LAist. This year, the number of registered short-term rentals in Palm Springs has reached 2,000, according to The Desert Sun. This amounts to a 92% increase since 2009. The figure is believed to be low, as it may not account for some rentals that are rented on the sly through sites like Airbnb and VRBO. The relationship between cities and short-term rentals has been…contentious. With residents complaining of unruly visitors and a perceived loss of community, cities have moved to impose their own set of regulations. This September, Airbnb filed a lawsuit against the city of Santa Monica, saying that the city&apos;s regulations on short-term rentals are unconstitutional. The company sued Anaheim as well earlier this summer, after the city had outright banned the use of short-term rentals.